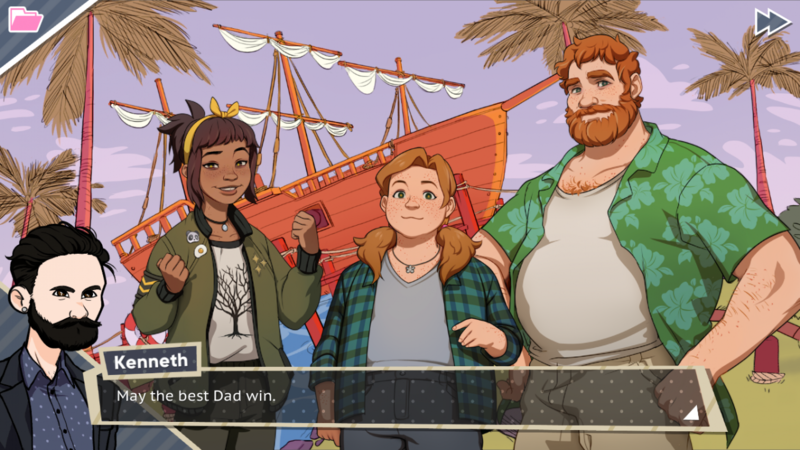 Dream Daddy: A Daddy Dating Simulator is better at simulating the relationship between a father and daughter than it is the potential romance of any one of its datable dads. Each of the seven heartthrobs I had the opportunity to pursue endeared themselves to me in one way or another, but as far as building up to a meaningful love story between them and my character, only a few notable exceptions managed to feel like genuine romances rather than platonic relationships with a designated switch at the end of their route. The story begins with you, a custom dad of your creation, and your daughter Amanda moving to a new home in a cul-de-sac populated by a variety of cute dads. At the outset, Dream Daddy gave me plenty of opportunities to customize my dad and his backstory. In creating him I was able to choose whether he was a cis or transgender man, decide whether he was gay, bi, or pansexual by mentioning the gender of my deceased spouse, and hint at the backstory of how Amanda came into his life, whether by adoption or surrogate. 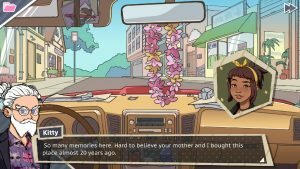 In these early conversations Dream Daddy demonstrates a wonderful sensitivity towards all types of families and people. Even if I didn’t find a ton of options I loved in the character creator—and couldn’t for the life of me make something that blended in with the great character art of everyone else in the game—I have to give it a lot of credit for how naturally these options are weaved into the game. Any fears I had that it would make a mockery of its subject matter went out of my mind quickly, and I’m thankful those fears were quelled through the entirety of my time with the game. This sensitivity towards representation extended to the datable dates, which include a wide variety of body types and ethnicities. Beyond its representation, Dream Daddy took me on some pretty markedly different love stories as well. 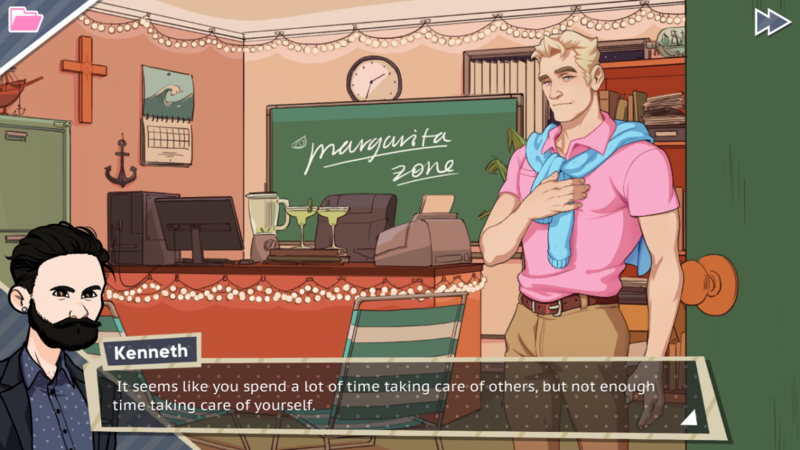 All seven love interests in Dream Daddy are dads, just like you, and a lot of times your relationship is built around each other’s home lives. Brian, being the proud father he is, had an adversarial relationship with me as I attempted to one-up him and his daughter’s accomplishments. Joseph, a local youth minister, leaned on me to help him organize church events in the midst of a hectic and toxic home life. And then there was Robert, whose lack of a relationship with his daughter led to some destructive habits—including our relationship at first. While I didn’t find every relationship interesting, each was instilled with heart and was elevated by witty writing. However, for the most part, this never really sold me on the idea that these relationships worked through a romantic lens. Each dad has three dates associated with their route, but the majority of them don’t explicitly hint that the relationship is romantic until the final date. Dates are initiated through an in-game friendly social media app called Dadbook, and meeting with the dads in question is always treated platonically—pretty much exclusively—until the climactic moment in the final date. Conversations with Amanda about whatever relationship you’re pursuing between dates always refer to your suitor as a friend, never hinting at romantic interest. Dream Daddy does a good job of forming friendships, but the shift from friends to boyfriends almost always felt contrived to me as relationships felt devoid of any romantic tension—even when I was making all the right decisions and saying all the right things. By the time I reached the end of a given route, the pay off never seemed natural. I was always glad to see resolution to these men’s personal struggles, but my romantic relationship came off like a token offer, a prize for getting to the end. In some cases I reached the end of a route and ended up not being in a relationship with the dad in question, and these endings were more genuine to me and subversive in a way that went against the artificial nature of others. The one relationship that was consistently strong was the father/daughter dynamic between my character and Amanda. Throughout Dream Daddy, Amanda is going through her own arc, dealing with the realities of growing up, leaving comfortable things behind, and understanding the world is bigger than what she’s experienced in her 18 years. Take the times when I had to console her during some dramatic experience or support her as her future began to take shape, and frankly that relationship is the one that stood out to me across every route of Dream Daddy. The father/daughter banter was funny, heartfelt, and even when it was about dumb high school problems I felt invested. As a whole, Dream Daddy‘s art does a better job at portraying the characters than its sound bites, a few of which have a noticeable dip in sound quality compared to others. Some sound professionally recorded, while others sound echoey like they were recorded over a Skype call. Alongside that, the music is serviceable, but none of the tracks really standout beyond the dream-like main theme of the game’s menu and credits. I enjoyed my time with Dream Daddy but calling it a good dating sim feels like a bit of a stretch. The dads I dated were cute and endearing, but the actual romance of the game seems manufactured, inserted into relationships that would feel perfectly complete without it. 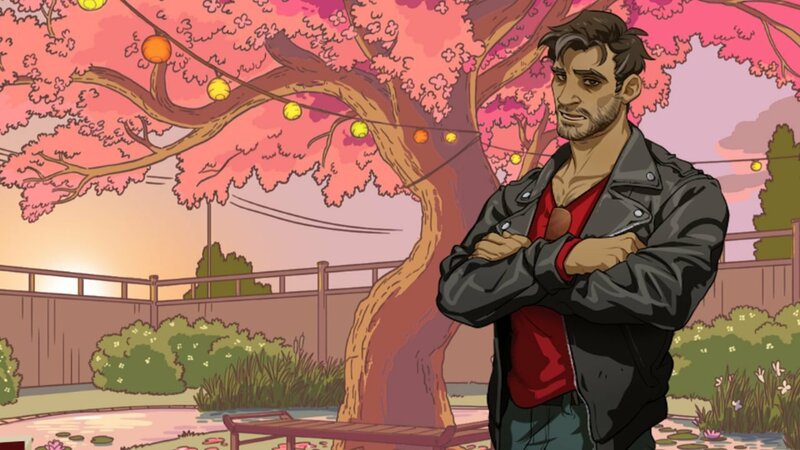 There’s humour and heart to be found here, but ultimately Dream Daddy feels like a better dad sim than it does a dating sim. 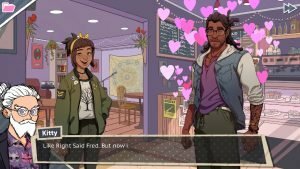 Dream Daddy is more of a dad sim than a dating sim, as its romance feels artificial on most occasions.